Graça e paz! If God is all-knowing and God’s Spirit is constantly working in our lives, is it right for a faithful disciple of Jesus to make plans? After all, God’s got everything under control! In our servant leadership training, we emphasize two key concepts in response to these concerns: “planning with open hands” and “discernment.” The first describes an attitude of humility that holds plans lightly, allowing God to surprise us with changes. Then, Pastor Jesus (his real name! ), of Central Baptist Church in Anápolis, Goiás State, asked us to lead a three-part AI process for about 40 church leaders. This is an amazing church family that participates in God’s mission in the world locally, nationally and internationally. They produced a very exciting vision for the church in 2025, and now they’re on their way! What a blessing it is for us to have the opportunity to strengthen and empower Brazilian Baptists! Thanks to YOU, we are able to “build up the Body of Christ” in these practical ways. P.S. Thank you for faithfully supporting us in this ministry. Your gifts help us to reach the fundraising goal set for us by International Ministries. It’s easy to give on line by following this link. One of our five major ministry areas is Servant Leadership training - our goal is to “empower servant leaders to strengthen the church.” In November we coordinated two major national events focused on leadership: a retreat for pastors and lay people on the theme “Servant Leadership by the Power of the Holy Spirit” with special guests Rev. Dr. John and Linda Piippo of Holy Spirit Renewal Ministries, and a Leadership Empowerment weekend for state-level young adult leaders. As we mentioned in our last ministry update, mission dynamics have changed dramatically in the last 20 years. The “receiving countries” have become the “sending countries” and visa versa. So here is a concrete example of the new thing God is doing: a small Brazilian church in a poor neighborhood is responding to God’s call to bring hope and new life to a community in the United States! We want to share the good news of Jesus in Boston - can you help us prepare for this ministry? That was the question Pr. Elias, Pr. Uelton and Miguel asked us a couple of months ago. On a recent visit, one of the church members who has relatives in a small town on the outskirts of Boston was overcome with love and concern for people she met. “They seem to be just ‘going through the motions’ of life in an endless rhythm: they spend long hours at work, come home and plop down in front of the TV, drink lots of alcohol to feel better, go to bed, and then repeat the whole process the next day,” she observed. They are desperate to experience the “abundant life” that Jesus promised (Jn. 10:10). Please pray that God will work in and through this team as it prepares to bring hope to families in a small town near Boston. May each of us also respond to God’s call to be messengers of hope in our community. P.S. Thank you to those who faithfully support us in this ministry. Please give generously to the World Mission Offering - you can even direct your gift toward “the support of Bruce and Ann Borquist”. That would help us to reach the fundraising goal set for us by International Ministries. What a rich, joy-filled, exhausting, encouraging two months our family has had - in 3 hemispheres! Wait. How can there be three hemispheres? Well, it all depends on your perspective. Over 1200 participants gathered for the World Mission Conference to celebrate 200 years of ministry in over 70 countries. Over 150 international partners joined with us to reflect on the past and plan for the future. It was deeply moving to see God’s family together to worship, share, and learn together. After 3 years of separation, what joy to spend time with our daughter Elena and husband Mark exploring “Middle Earth” and the jaw-dropping beauty of northern New Zealand. “This was the best pastors’ gathering in years!” commented one national leader. Folks were inspired by the speakers and workshop leaders, including Dr. Clay and Cheri Ford of ABC-related Holy Spirit Renewal Ministries who shared from their hearts about our individual and corporate identity in Christ and our calling to be God’s agents of transformation. Thank you for walking with us on this journey. We are able to use our gifts and abilities to strengthen the Body of Christ here in Brazil because of your prayers, cards, emails, and financial gifts (we are currently at 82% of the personal financial support goal IM has set for us). Pastora Marizeth spoke the above quote at the end of the 3-day retreat held in northern Brazil. She had invited us to lead a training for two state conventions in her region: Pará and Amapá. We offer this as Coordinators of the National Convention’s leadership and ministry development program called SEDELIM (Secretaria de Desenvolvimento de Liderança e Ministérios). It was a grand gathering of over 70 leaders of the state convention, the pastors’ council, the Baptist women, the Baptist men, JUBAN (youth and young adults) and several churches. You are also called to be a leader in many different situations. Among all the examples and models of leadership promoted today, whose do you follow? What kind of leader are you? May we all be more faithful imitators of Jesus in the way we interact with others - as both leaders and followers. He sends us to be his witnesses through the power of Holy Spirit “here, there, and everywhere” (Acts 1:8). Our jaw dropped when Pastor Wagner Bretas, Shallom’s senior pastor, presented this year’s mission offering goal – R$270,000 (about US$120,000)! Pr. Wagner joyfully recounted the faithfulness of the Lord expressed through the church every year since it was founded 19 years ago, when the first offering was R$65 (about US$30 today). On Sunday Ann explained the deeper meaning of the Hebrew word hesed in the Old Testament to about 120 people in the adult Sunday School class. Hesed, often translated as “faithfulness” or “loyalty,” has the connotation of “love or goodness expressed in action.” Being faithful to the Great Commissions of Jesus, then, means actively participating in the Lord’s harvest as Christ’s ambassadors in our family and friendship circles, in our community, and in caring for God’s creation. At the final Sunday evening worship service, we challenged the church to be “The People Who Represent God to the World” based on Exodus 19:1-6. As God’s holy (“set apart”) people, we are called and empowered to express God’s hesed: love in action. We are inspired by the commitment of this church to live out God’s mission in a variety of holistic ministries. God is using Shallom to bless its city through two drug and alcohol recovery houses, a shelter for abused and abandoned children, a community recreation center that serves both teens and senior citizens in a poor neighborhood, vocational and English language courses, and a theological seminary. 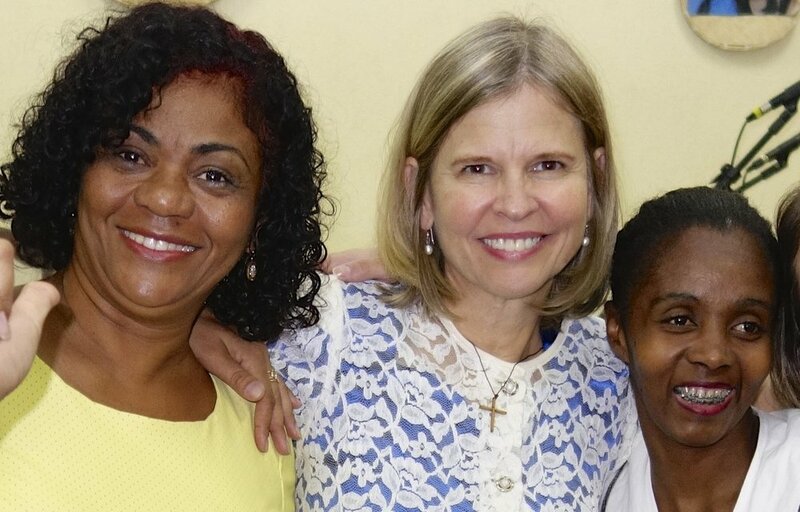 At the national level, Shallom makes short-term mission trips to poor communities in the rural areas, and it supports several national missionaries who serve in Brazil. It is especially in the international dimension of mission that the scope of the church’s call becomes evident: Shallom supports a total of 19 cross-cultural missionaries who serve in 10 countries around the world through the Baptist Convention’s cross-cultural mission agency JAMI. In God’s perspective the local church doesn’t DO missions - the local church IS God’s mission, present and active in the world. As a well-known missiologist observed, calling a church “missionary” is like calling a woman “female:” either the church is missionary, or it isn’t a church. Shallom Baptist Church is a living example of a church that seeks to be faithful to God’s mission in its entirety. Truly, this is a hesed family of faith that is committed to being Christ in the world. Our time with the Shallom family spurred us to reflect on our own local congregation: How hesed are we? What can we do to encourage one another to an even deeper expression of God’s hesed? Reflecting on this, we also praise God for your hesed as you walk with us in our ministry in Brazil. Your prayers, your emails, and your financial support gifts to International Ministries make all the difference! “God put us here on purpose"
"We want to present the good news of Jesus in our neighborhood in an authentic way," said Pastor Wasny. His church recently moved out of a rented storefront and is now in the process of building its own facility–and its place in the neighborhood. “It's not enough to just put up this church building so we can hold services in it on Sundays. God put us here on purpose to bless our community in every way," he told us. Pr. Wasny was inspired to seek new ways for his church to bless the community after participating in the 1st National Consultation on Integral Mission we coordinated in November last year (see our January ministry update). As a result, he recently invited us to lead a training for his church on Integral Evangelism. We began our training at the church on Friday night with a Bible study reflecting on the redemptive mission of God and why Jesus came to earth. Saturday the group explored why the church exists, the role of the local church in God's mission, and what is poverty from God's perspective. (By the way, how would you answer the question "Why does our church exist?”) Saturday afternoon we ended with a practical seven-step planning process, and presented examples of how to mobilize the whole church to be part of the whole mission of God. We praise God for this church family and its pastor! The church has now begun a 30-day prayer campaign, and folks are meeting every morning and every evening(!) at the church to "seek God's vision for our city. … We want to understand how the Lord has prepared us to start specific ministries in our neighborhood. Then we'll prepare ourselves to start our first seed project." They are also planning a prayer walk and march in cooperation with other churches in the city in March. Their excitement and commitment is contagious! This is Jesus' model of evangelism: the good news of the presence of the Kingdom of God proclaimed in words and actions. Thanks for walking with us in this ministry! The theme of the Consultation was: “Integral Mission – from Theology to Practice” based on Jesus’ example in Matthew 9:35-38. Five working groups reflected on different topics related to the theology of integral mission and prepared a statement to guide CBN churches. We led two of the six workshops that provided hands-on training in the practice of integral mission in the life and ministry of the local church. People were challenged during morning Biblical expositions and evening worship services to participate in God's mission and share the whole gospel for the whole person in the whole world. Break times and fellowship around the table gave participants a chance to make new friends and learn from each other. On the final day of the Consultation participants gave thanks to the Lord for this rich opportunity of learning, challenge, and inspiration. “I believe that this Consultation was bathed in prayer, for we received a feast, a gift from the Lord. I'm leaving renewed by the Lord to continue the work,” said one participant. The Consultation produced a rich “virtual library” of resources in the theology of God’s integral mission and its practice in the life of the local church. Check it out by following this link. We are especially delighted with the training videos that Ann and our son Asa produced on the best practices and leadership strategies of churches that engage in integral mission in the Brazilian context. Take a look at the videos on REDEMI’s YouTube channel, and let us know what you think! What an amazing experience: over 1,000 jovens (youth and young adults) came together from all over Brazil for a weekend of praise, prayer, reflection and fellowship in November. This was the 17th annual Jovens conference sponsored by the Convenção Batista Nacional (National Baptist Convention of Brazil). We were there as Coordinators of the department that supports the national youth, women’s and men’s programs. Two extraordinary young women from ABC New Jersey joined us for the conference and stayed afterward to experience more of Brazilian culture - especially churrasco! Only a few hours after stepping off the plane, they jumped in to help our team prepare for the arrival of cars and buses chock full of young people from all over Brazil. The conference itself was a grand success - people made new friends, prayed for one another, and stayed up singing under the warm summer night sky. Many expressed renewed commitment to walk closer with the Lord and to work together with their local church to reach out to their community, including Annie (Annairis) and Mari (Maria Isabel). Seeing so many young worshipers and people who are hungry for the Lord made me wish that same desire for the youth in my church. I feel like the candle that was lit within me ... has been transformed into a blazing fire. ... no matter where we come from and how we choose to serve and praise our Lord we are all one big family in the eyes of our Father. Praise God for these young leaders of today and tomorrow. Louvando a Deus com vocês (praising God with you). Have you ever studied an entire semester’s worth of material in one week? 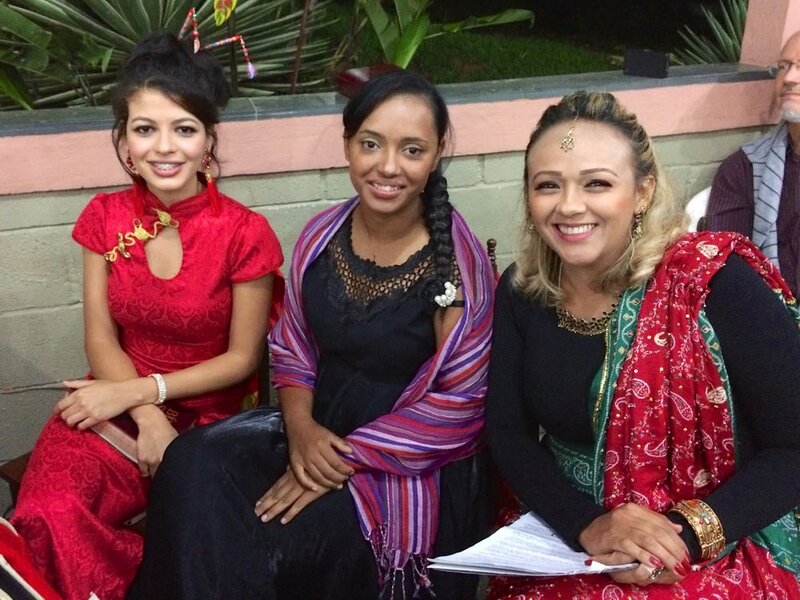 Students at JAMI, the cross cultural mission training center, do exactly that nearly every week for 16 months - and serve in a local church on the weekends! We recently returned from 2 weeks at JAMI, where we had the privilege of teaching 8 extraordinary new candidates for missionary service. This module is of paramount importance in my ministry. Understanding missionary work in a different light, that integral mission is "The whole Gospel for the whole person for all people," mademe think a lot. I need to know the needs of the place and the people that I will work with. The solar oven, the composting latrine and the mini company are important things that I want to use according to the needs of the place where I’ll be serving. Praise God for this dedicated group of young women and men who are preparing for cross-cultural service here in Brazil and in West Africa. They graduate from their training program in December, and will do a 3-month internship in Guinea Bissau starting next February. We have a big event coming up in November! Please pray with us for the first national "Consulta de Missão Integral" (Integral Mission Consultation) that we are organizing for the National Baptist Churches of Brazil. During the period 14-17 November, participants from all over the country will be here in Brasília to be informed, challenged and equipped to "be" Jesus in their communities. We have chosen the theme "Integral mission: from theology to practice" to guide this historic event. It's a huge undertaking, but one that we hope God will use to mobilize National Baptist churches all over the country to make God's love in Jesus real in their communities. Thanks for your prayer and financial support that makes all this possible! At a recent gathering, a pastor invited us to do a servant leadership training workshop for his region. “Consider this a Macedonian call: come and help us,” he concluded with a smile. We have been to several “Macedonias” in the last couple of months. English is a crazy language! Our students at the JAMI cross cultural missionary training center puzzled over the extra “do” in “What do you do?” for example. One missionary colleague serving in Senegal remarked, “This class made a huge difference in my language skills. Now I’ll be able to work with teams that come from different parts of the world to work with us in the rural areas.” Other students are heading for Mozambique, East Timor, Morocco, and Guinea Bissau. A Blessing At a national gathering of Convention churches, a senior pastor from Rio de Janeiro made a special point of telling us, “Thank you for leaving your country and coming to work with us here in Brazil. You are a real blessing to us.” What a gift of encouragement to continue our work in Servant Leadership training and Holistic Mission mobilization with the National Baptist Convention! We are writing this ministry update from Myanmar in Asia, where we are teaching several courses in Social Entrepreneurship, Servant Leadership, Spiritual Journeys, and Cross Cultural Team Building and Conflict Management. Hope abounds as citizens experience more freedom and the country opens up to the world. Back to Brazil in September. Thanks for being on the journey with us! I’ve Been Praying for You! “You don’t know me, but I know you. I’ve been praying for you for the last seven years. And now I have the joy of meeting you in person!” Helio declared as he gave us each a bear hug. What an incredible gift of God’s grace - to meet a brother in Christ who has lovingly walked with us on this journey without us even knowing! He continues to pray for our family and our ministry every morning. Meeting Helio was one of the highlights of our recent visit to his church in Jundiaí near São Paulo. We also learned that this young (11 years old), fast-growing (400+ members) church has developed ministries with urban skate boarders, street people, and with shoppers at the local farmer’s market. Through his prayer support we feel like we’re a part of their ministry as well! Helio is part of a huge “cloud of witnesses” (Heb. 12:1) who faithfully “hold the rope” for us. The amazing thing is that we have never met many of these special people. As I was writing this journal, I received a message from Esther in the midwest saying that she has been encouraging her church to pray for us and nine other missionaries - and to keep in contact. Another faithful prayer partner whom we have never met! “Aula maravilhosa. Senti muito a presença de Deus dentro da sala. Obrigada, Jesus, por tudo o que vais fazer.” (A marvelous class. I sensed the presence of God in the classroom. Thank you Jesus, for all that you will do). We received this feedback from one of the 50+ participants in the Holistic Mission course we taught in January and February at our local church, FBC of Brasília.Folks really enjoyed the combination of lectures, discussions, and role plays we put together to help people think deeply about our calling as followers of Jesus. We wrestled with questions like: Why does our church exist? Is the ‘good news’ just for the hereafter or is it for the here and now as well? How can we be a blessing to our community? At the end of the last class, people signed up to be a part of a team to reach out to our city and beyond. We want to minister to kids, youth, the homeless, prison inmates, and the elderly. It is energizing to be on this new journey with God’s people. Let’s see what happens! Please pray with us that God would lead this family of faith to make a difference in our community, country and world. “Yes, you’re missionaries in Brazil, but what do you do?” Sometimes we get questions like this, and since we’re working on our 2013 calendar right now we thought you might be interested in how we’re hoping to build up the Body of Christ this year. Please pray that God would use us to challenge and encourage God’s people to make a difference in the world in 2013. And thanks for being on the journey with us! We couldn’t do it without you. “It was really rewarding! Pastors Bruce and Ana … were greatly used by God to bless and challenge us to participate in the whole mission of God,” remarked Pr. Manoel Lino, the organizer of the holistic evangelism training we led for church planters in the semi-arid sertão region in northeastern Brazil. This was the first of many events during our recent 2-week trip in the states of Pernambuco and Bahia. One day, we visited Trindade, a center for gypsum mining - the material used to make wallboard, ceiling tiles, etc. Because of the huge number of truck drivers that pass through, it also has a reputation for drug trafficking and child prostitution. Its a pretty grim place. We had the opportunity to spend the day with a young couple who is pastoring a small church there. We praised them for their faithfulness and encouraged them to look for practical ways to make a difference in their community. Pr. Cláudio and Vanda are delighted that their church in Orocó has recently started to grow dramatically. We visited two of their daughter churches and brainstormed with the pastor ways to mobilize all those new members to be a force for positive change in the town. Now back home, we are looking forward to having our son Asa with us this Christmas. Our anticipation and excitement about his arrival reminds us of the joyful expectation of the birth of the Messiah and the promise of Christ’s return. We wish you a blessed time with family and friends as you celebrate the birth of our Savior. Malhada, Agrovila 23, Feira da Mata, Iuiú, Pitarana. All of these small towns in Brazil’s semi-arid sertão have in common long, dusty dirt roads, isolation and a local Baptist church. On a recent mission trip to this area we visited these churches and pastors. Everyone expressed gratitude that we took the time to come all the way from Brasília to encourage them. They live and serve in a thirsty land where nothing comes easily, but they persevere and rejoice as they see God’s Spirit at work. holistic evangelism. The 45 participants enjoyed the presentations, small group work, and skits. We dealt with important questions like: Why does the church exist? What is the gospel? What does is mean to be “the Body of Christ” in the world? What is poverty? How do I mobilize the whole church for the whole mission of God? How can we learn about our community’s resources and needs so that we can respond with Jesus’ love?We are excited that folks left with a new vision for what it means to share in word and deed the good news that the kingly reign of God is present in their communities. “I have a confession to make, sisters and brothers.” We had just finished our workshops on “Holistic Mission” at the annual gathering of National Baptist churches in Espírito Santo state, when the one of the leaders asked for the floor. We weren’t quite sure what to expect, since up to this point the feedback had been very positive. Our Christian brother was right: triumphalism and superiority complexes have no place in global Christian mission. What we need are co-laborers - wherever they come from! Workers called and prepared by God to strengthen the worldwide Body of Christ (the church) so it can cooperate in God’s mission here, there and everywhere. National borders and geographical distance are no longer the barriers they once were. What matters now are things like partnership, a servant attitude, cooperation, flexibility, creativity, freedom, accountability, a focus on people and a holistic approach to ministry. We are humbled by this leader’s words, and at the same time convicted. How about you? Your town, your country, especially our world needs fewer “foreigners” and more “co-workers.” Will you respond to the call to be one of them? We’re off to a roaring start! The national gathering of pastors and spouses we attended several weeks ago drew over 600 participants and allowed us to make initial contacts with many pastors as well as the national leaders of the women’s, men’s, and young adult ministries. We are now working with them to prepare regional and national training events that will help people grow in Christ and put their faith into practice. “Hurry to the window honey, the waters are rising quickly!” The pastor and his wife scrambled through their kitchen window to escape rising flood waters during torrential rains in Rio de Janeiro earlier this year. Until now, the Convention has had no organized way to provide assistance to churches or families that have lost loved ones, homes, or possessions due to floods and monstrous landslides. We are gathering ideas from colleagues in the Philippines, Chile, Japan, Haiti, and the U.S. in order to design Projeto Mateus 25: Seja Preparado (The Matthew 25 Project: Be Prepared). We are touched and deeply encouraged by your generous support. Thanks to many of you who gave “above and beyond,” we are just above the 90% financial support level International Ministries has required that all missionaries reach by September 30. In January, we were at only 74% and wondering if we would be allowed to return to Brazil - so this is an amazing victory! God is good!